Select Width 6" 8" 10" 12" 16"
Copper flashing made with non-asphalt adhesive and a polypropylene backing. 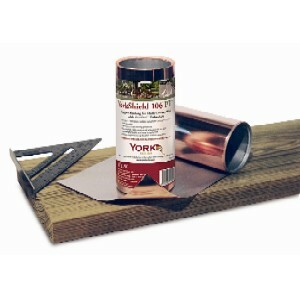 Specifically made for pressure-treated decks and can be used as a foundation flashing. It has superior tear and puncture resistance, along with a high de-lamination threshold. Comes in 20 foot rolls. Select width using the dropbox.